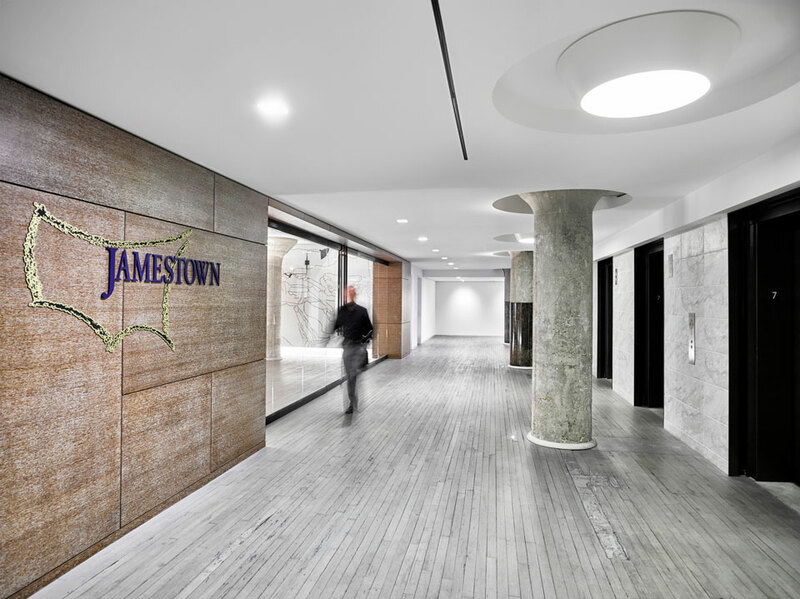 Designed by Gensler architects, the Atlanta, Georgia office of Jamestown investment firm features a series of Plus ceiling lamps by X. Claramunt & M. de Mas along a walkway. Their circular silhouette echoes the oval apertures of the nearby concrete pillars, while their matte white finish blends into the ceiling in keeping with the minimalist aesthetic. Plus’ large lampshade adopts the form and function of a skylight, casting a broad swath of ambient, uniform light upon the hallway below. 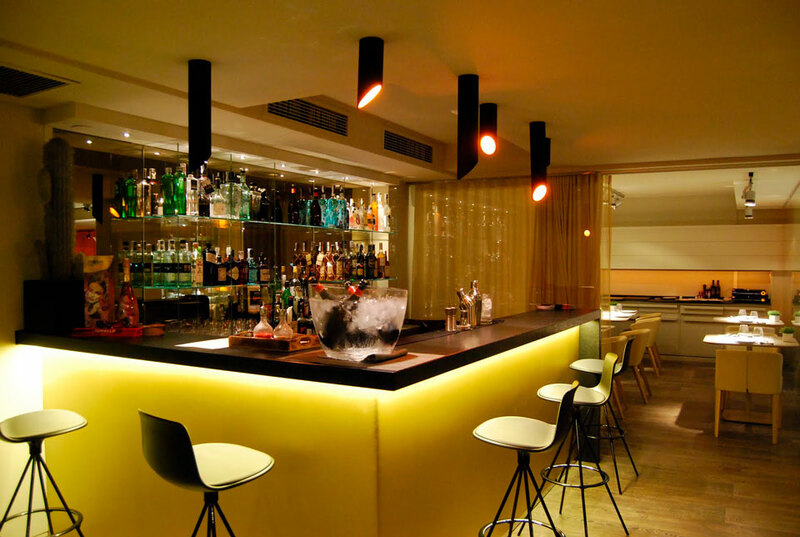 At the sleek espai Kru seafood restaurant in Barcelona, Victor Carrasco’s 45° LED-powered fixture illuminates the intimate cocktail bar. 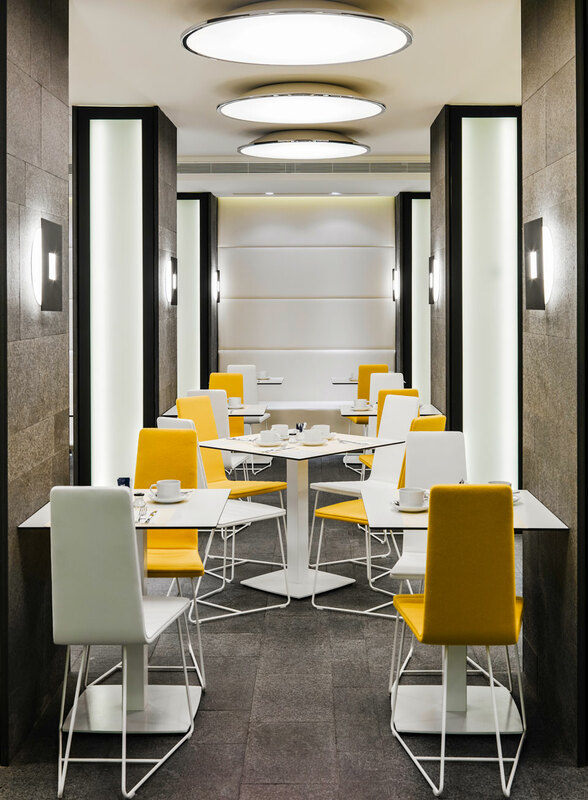 The customised composition of vertical tubes in varying lengths creates an array of glowing focal points. Suspended from the ceiling like exposed metal pipes, they resemble industrial avant-garde art, their angled tips enhancing the sculptural effect. At the Pitsou Kedem-designed Gindi Holdings headquarters in Tel Aviv, Link XXL makes a striking modern statement. Designed by Ramón Esteve, the LED-powered lightfeatures cubic panels in different heights and depths that appear integrated into the architecture of the ceiling. 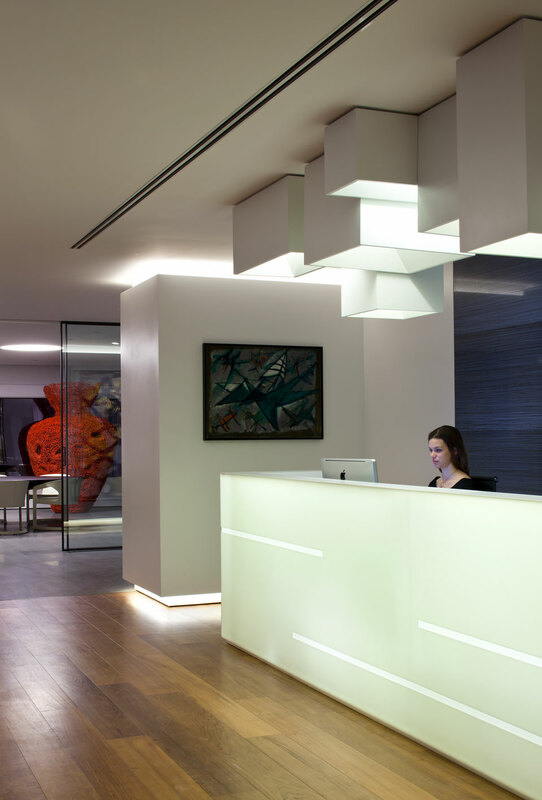 The dense cluster of geometric modules forms a dramatic focal point above the reception desk, conjuring the look of an urban skyline. In the lounge, the rhythmic variation of the lamp’s volumes creates a sprawling ceiling sculpture that casts a soft, ambient glow over the relaxed space. 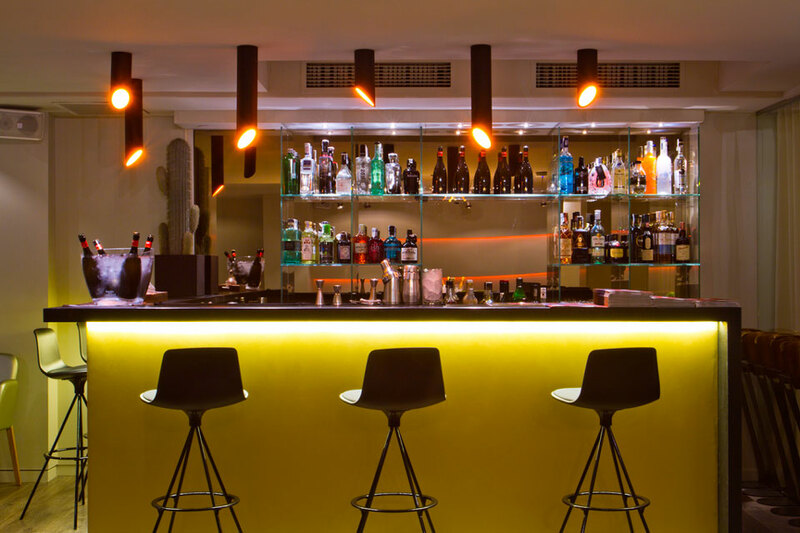 Barcelona’s contemporary Restaurante Novecento features Big, a Lievore Altherr Molina fixture. 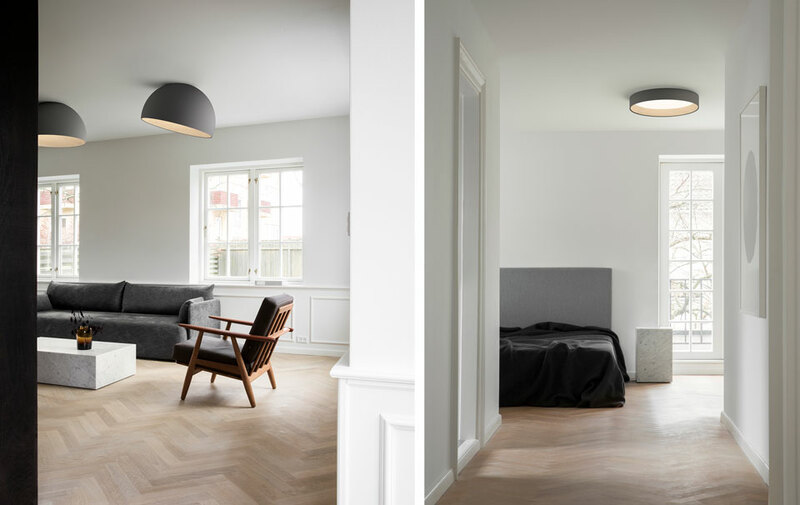 Big reimagines the utilitarian ceiling light with an enlarged diffuser that covers nearly the entire chrome fitting. 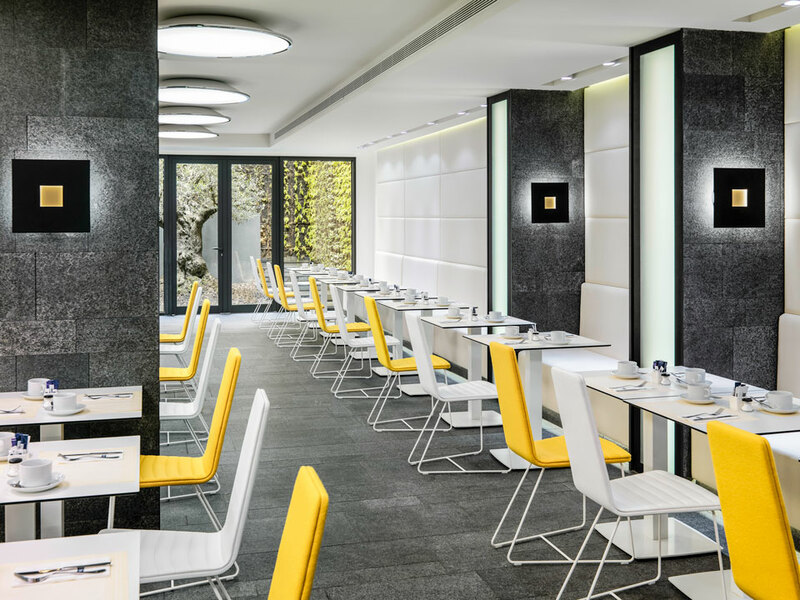 The simple, oversized form evokes a glowing orb overhead, its pure, geometric silhouette consistent with the dining room design by GCA Architects. Designed by Ramos & Bassols for Vibia, Duo integrates into ceiling architecture like a skylight channeling the brightness from outside. Distinguished by its rich, wood interior and a gently curved organic form, it exudes a soothing, enveloping sensibility, while commanding a space with its striking material mix overhead.